When Margaret Thatcher died on 8 April 2013, she remained alive and well in two West End characterisations, neither particularly flattering. 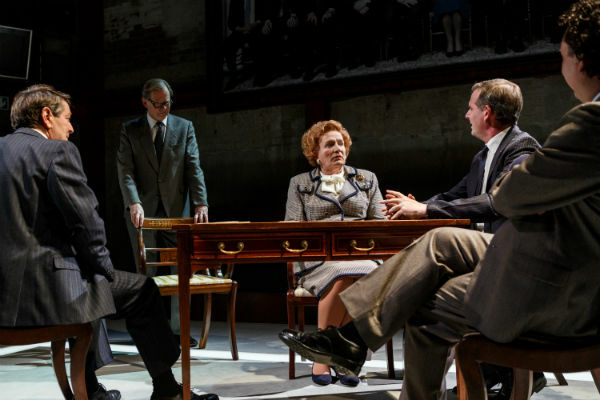 Meanwhile, across the West End in another production directed by Stephen Daldry, Haydn Gwynne’s Thatcher was nightly the subject of Helen Mirren’s ire as the Queen’s least favourite PM in Peter Morgan’s play The Audience. On the day of Thatcher’s passing, both Daldry-led creative teams came under pressure to change their shows’ as a mark respect. For Billy Elliot, they even put it to an audience vote as to whether “Merry Christmas, Maggie Thatcher” should stay or go. In both instances, the decision was that neither the scripts, nor the recent history they covered, should be rewritten in any way. Sylvestra Le Touzel will play Thatcher when The Audience reopens at the West End’s Apollo Theatre from 21 April 2015. Two years later, Billy Elliot continues to run at the Victoria Palace; and The Audience has premiered on Broadway, with American Judith Ivey as Thatcher, and is about to be revived simultaneously at the West End’s Apollo Theatre, with a new Thatcher (Sylvestra Le Touzel) and Queen (Kristin Scott Thomas). Meanwhile, we’ve had a double dose of Thatcher (and the Queen) in Moira Buffini’s comedy Handbagged, a hit at the Tricycle that transferred to the West End last year, and is about to embark on a UK-wide tour in September. 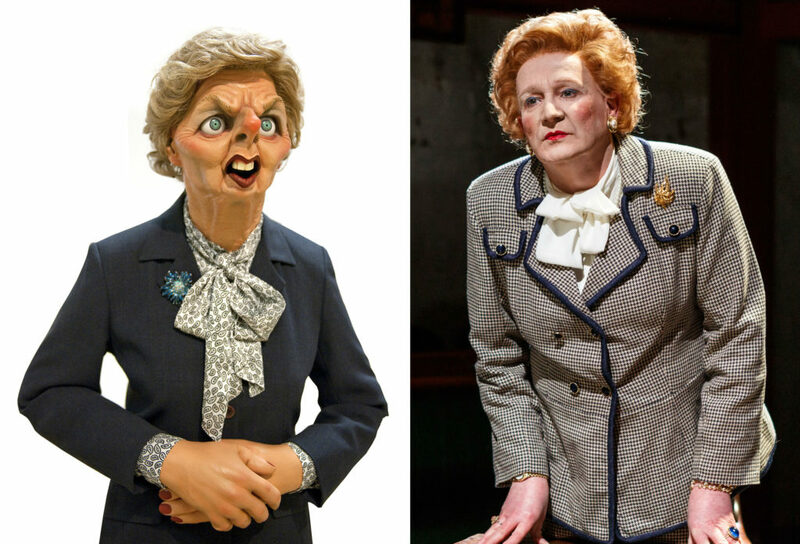 And now, we have a man who’s made a career out of voicing Thatcher, Spitting Image’s Steve Nallon, physically embodying her in the premiere of Jonathan Maitland’s Dead Sheep, just opened at the Park Theatre. Of course, there have also been myriad screen versions of Maggie. On film and television, actresses who’ve played her include Meryl Streep, Lesley Manville, Lindsay Duncan, Andrea Riseborough, Kika Markham, Louise Gold, Patricia Hodge, Greta Scacci, Jennifer Saunders and Maureen Lipman. Artistically speaking, Thatcher simply will not die, not any time soon any way. Here are more stage depictions of the late PM over the past decade. How many have you seen? 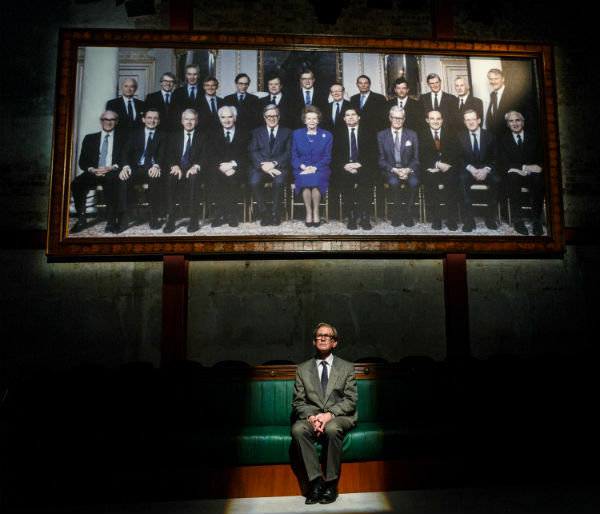 Jonathan Maitland’s new play takes its title from a quote by Denis Healey about Geoffrey Howe. 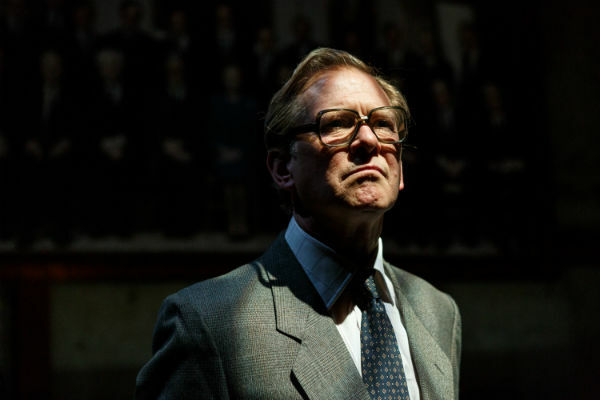 As fascinating a character as Thatcher is, let’s be clear: Jonathan Maitland‘s new play Dead Sheep it not about her, or at least, not about her alone. It’s really about “the man who stabbed her in the front”, Geoffrey Howe (played by James Wilby), and his 16-year political marriage with Thatcher, which was often at odds with his real 62-year marriage to his outspoken wife Elspeth (a fantastically feminist Jill Baker). As love triangles go, this one takes some beating. After being demoted by Thatcher from his post as Foreign Secretary, the moral crisis for Howe came when Thatcher drove relations with continental Europe to a new low, making a famous “No No No” speech concerning her determination to never sign up to a single currency. Rather than go quietly, Howe used one of the first televised Commons sessions, on 1 November 1990, to make a resignation speech in which he effectively outed Thatcher, the bully, with sensational effect. The speech triggered a leadership contest which precipitated Thatcher’s downfall three weeks later. Dead Sheep culminates with a recreation of this speech, with Wilby’s Howe rising magnificently to the occasion as the ‘little man’ who realises he has a big voice. 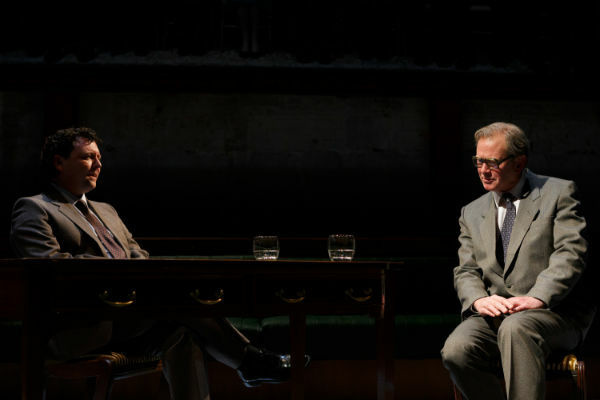 In Ian Talbot‘s in-the-round production, a camera is trained on Nallon’s Thatcher, dead-centre of designer Morgan Large‘s Parliamentary front bench, as she listens, stony-faced, to Howe’s character assassination, at one point gripping her handbag in her lap like a shield. It’s a moment that everyone, particularly political history buffs and anyone who has ever been a victim of bullying, will relish. Dead Sheep runs at London’s Park Theatre until 9 May 2015.